“I like our Snowman”, originally uploaded by Craftydiddl. i think i can see the light at the end of the tunnel!! Whew!!! i am almost there-after my last post i thought i was getting better but boy was i ever wrong-It had one more big punch for me that lasted from Thursday to Saturday. Saturday i did get up to do a couple things but there were big breaks in between each thing so still a lot of time in bed. On Sunday i actually did some KNITTING-it was nice to pick up the needles again. Today i even got dressed and went grocery shopping. BUT there is a downside to all this Little Man is very sick now 😦 and i passed it on to hubby as well but he is already on the mend. 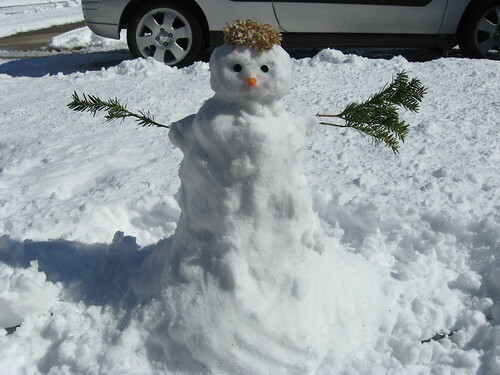 So when did we have time to make a snowman? Last Wednesday we did when i wrongly thought i was on the mend and Little Man was still healthy and full of energy. He ran around shoveling and playing in the snow. Got me with a snowball a few times 🙂 made the snowman’s head-i did the rest and he was kind enough to remind me that he needed eyes and arms and a nose. The he disappeared to the backyard for some shoveling but when it was all done he came over and said “I like our Snowman, Mommy” I like it too-it was a fun time and i enjoyed watching him play in the sun and snow. I’m taking things slow and have some catching up to do but i hope to have some thing to show off soon. OOh I am sure Mr. Snowman was worth it as great memories are priceless! Hope Little Man feels better really soon! I hope everyone feels better quickly.